It doesn’t always go the way you plan. That was true for children’s book author, Allison Crotzer Kimmel. Since 2014, Allison has published three books for children through Capstone Publishing, all of them nonfiction. “They were each so interesting to write but all were a surprise as I think of myself primarily as a fiction writer,” Allison told me in today’s interview where she shares insights from her unexpected path into children’s writing . Can you picture yourself on this path to publication? Find out why Allison’s thrilled with her unexpected career in this interview and career snapshot of the children’s book author. MW: In your experience, what do children’s authors need to be successful? AK: For me, it was first having a respect for the craft. Read all you can. Read the classics and read the stuff that is popular now. That’s not to say you need to mimic these books, but I think it’s essential for every would-be writer to take the business seriously enough to know what is important artistically in the business. Work on craft, then—after a period of time—worry about the business of the business. Go to workshops and join professional organizations like the SCBWI and go wanting to know how to create beautiful work, not necessarily with the idea of getting an agent, getting published, and dollar signs flashing in your head. MW: It sounds like the qualifications for a children’s author match those of many writing fields. But what about the work? What’s an average day in the life of Allison Crotzer Kimmel, Children’s Author? AK: I am lucky enough to be a stay at home mom, so honestly life can and will get in the way of writing if you let it. I’ve devoted myself to being a mom first these years when they are small, so work happens when they nap, play outside my office window, watch a movie, or when my wonderful, fabulous (did I mention understanding?) husband takes them to the park or out on a day-long jaunt. The ideal day is waking up and not having to worry about feeding hungry kids or myself. I have already done the prep work—I’ve outlined and character studied to the point of knowing them without fear of the blank page. I write. For hours. And honestly, there is no sense of time. I love that zone. The whole morning can pass, and I’m there, right with my characters. But then there are other days. Days that deal with the business of the business, and honestly, I like those, too. These are days when I plan for school visits, come up with workshop activities, send out more queries—the “pick me, pick me” love letters I still send to agents and editors, mostly just ones who I’ve met at professional conferences. Every part of my writer workday is exciting, honestly, because in each one lies the hope that the character will connect, the words will flow, and someone out there will take a chance on them as I, the writer, have. MW: I’m interested in how you broke into the children’s writing career. What was your secret? AK: I attended workshops and conferences through SCBWI. I went to one where an editor from Capstone spoke about publishing in the educational market. I submitted my work, very serious nonfiction centered around World War II era—my personal passion—and three months later, I got a call. She’d liked my writing. I demonstrated I could write. But the project she had in mind was a less weighty book on fashions of the 80s and 90s. It wasn’t at all what I expected my first book to be, but being a child of the 80s myself, it turned out it was the perfect way to break in. MW: Sounds like the path to publication can be a little unpredictable, which turned out not to be a bad thing. But what are the best things about your job? AK: I love that feeling when the work is clicking. When it is coming together, and it flows so easily, it’s almost like someone else has taken over your brain and your keyboard. I also love getting the “yes,” which as a writer, I expect to be chasing the rest of my life. And honestly, there is nothing like opening that box of author’s copies and seeing your name on a book. I kept my maiden name, Crotzer, because my grandpa was an avid reader. He passed away before he could see my dream realized, but I like to think every time I hold one of my books with his family name on it, he can see it, too. MW: What about the challenges in this career path? What should future children’s authors prepare for? AK: The challenge is time. It can slip away and leave you with a blank screen, an unfinished idea, and a pile of manuscripts that need to get out. The real challenge is making time in life to be a writer and also to live a life. I know I have to stay seated at that computer to get those ideas flowing, but I also know that I have to experience some of my other life outside of writing so I have something funny or inspirational or just real to write about. MW: What are some non-writing career necessities you have to keep up with as a published author? AK: I’ve learned that as I launch my career, it’s essential for me to have things like a website and at least a basic awareness of what I am putting out on social media. I have to keep up with other writing professionals. It’s important to read blogs, to stay connected socially, and to use the changing landscape of technology to help me grow as an informed professional. I also love doing the school visits and other teaching events. I’m always looking for a new story or a new character, so all of these publicity and promotion and speaking events…well, watch out, because I may meet you for ten minutes and put you in my next manuscript! MW: Any last tips for writers and aspiring children’s authors? AK: Listen to kids. Hear the way they talk. It’s probably been a while since you’ve been a kid yourself. Try to eavesdrop and understand what’s important to them, what’s affecting their lives in the here and now. But also be sure to dive back into your past. If you are writing about a twelve year old protagonist, think back to who you were at twelve. Connect with that person. I’m convinced the fragments of who we once were are still very much a part of us now. Go back, rediscover yourself, and you’ll be able to create a character that will ring true for children reading your work now. I’d say to wait until the whisper to write becomes a roar, and then you’ll know it’s time. You have stories to tell and characters to explore with greater understanding. It’s time. Go write! 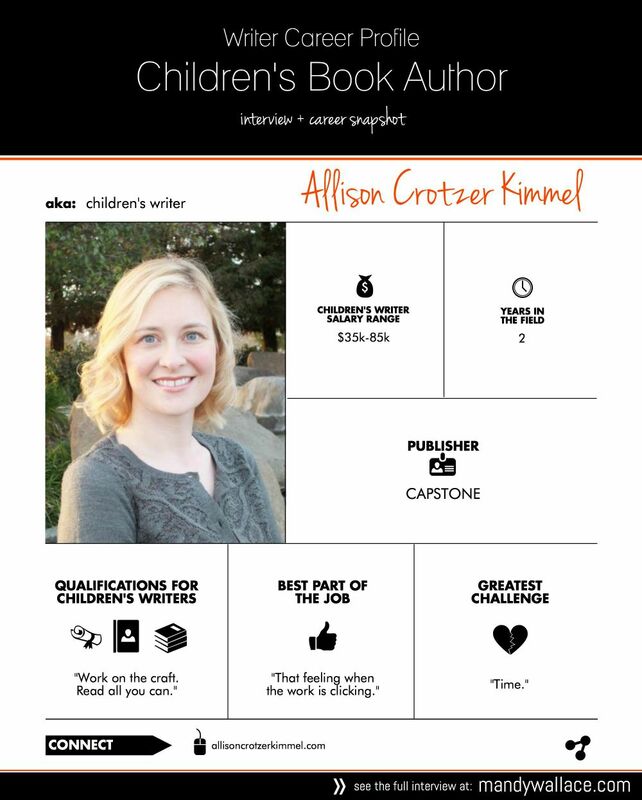 Allison Crotzer Kimmel is a published children’s book author with three titles on the market. Find out more about her and where to pick up her books on Allison’s website. I have loads of journals full of “word sketches” which I always intended to turn into stories. Trouble is I am one of those perfectionists you wrote about. The struggle to break free is an ever lasting battle. I feel like your blog can plan a big part in helping me “get over the hump”. Glad to hear it helped, Diane. Perfectionism kills more writing careers than anything (I bet 🙂 ) Good luck!